This type of tooth filling is made of composite resin, which is a tooth-coloured material that is applied your tooth to restore its optimal form and function. 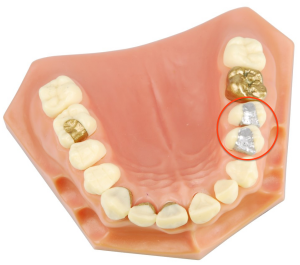 In contrast to amalgam fillings, which look very unnatural, White Tooth Fillings can easily blend with the natural shade and colour of your teeth. This aesthetic advantage has made composite resin the more popular choice when it comes to tooth fillings. An initial dental consultation is necessary to assess the extent of the damage. Decay or damage is removed and the area is thoroughly cleaned and disinfected. The tooth is then isolated to prevent moisture from interfering with the bonding process. Dental adhesives are applied on your teeth, followed by the composite resin material. The resin is hardened using a specialised light. Your trusted Brisbane dentist will give you tips and reminders on caring for your teeth and gums. Bring back the form and function of your damaged teeth quickly, effectively, and beautifully. For splendid work on White Tooth Fillings and other dental treatments under Restorative Dentistry, consult your dental care partners here at Precision Dental. Your reliable Brisbane dentist is equipped with the very best of modern dentistry so as to help you achieve optimal dental and oral wellness. Call us today on (07) 3852 1160 or book an appointment online.